Here are my Coleus 'Tilt-a-Whirl' for this year. The larger plant on top are cuttings I took from this plant. During the winter, it has lost it's swirling petticoat leaf shape and turned greenish orange. It will most likely return to it's darker swirling leave once it returns outdoors. 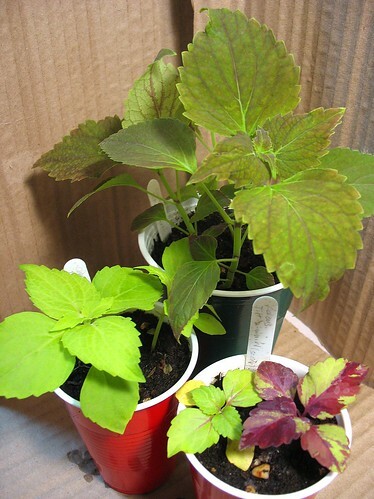 The two cups below contain seedlings from the same mother plant as the above cuttings. Two are almost a pure chartreuse while one is chartreuse with a purplish vain. The one on the bottom right is a kaleidoscope of green, burgundy and reds. It'll be interesting to see how these hybrids turn out.